Okay, I just can’t let that go. Granted it is Facebook which makes no claim to the authenticity or veracity of anything posted. And it is Facebook where we go these days for our news and opinions. And it is kind of fun to see where you fall out in these “games.” Perhaps we learn a little something about ourselves, which helps us feel comfortable in our own skin. Learning and comfort can be a good thing. So why did this get my attention? Because it stereotypes, and stereotyping limits. Years ago, I watched an organization stereotype employees into birds. If you were an owl, you were quiet and industrious. An eagle dominated the room. A dove sought peace everywhere. And I bet you can guess the nature of the peacock! Of course, this was applied in a workshop that started with answering a series of questions, and then plotting where your questions put you in terms of assertiveness and emotionality. You end up somewhere in a quadrant based on a two-dimensional matrix. “Somewhere” is the key. To truly believe that there are only four types in our world is, of course, ludicrous. Even in the “bird” test, there are nuances that tell a more robust story. In this organization, HR presented the birds in an hour workshop. Fifteen minutes of the time was spent taking the assessment. The remaining time was spent telling participants about the attributes of each quadrant. So we minimize the learning and reflection in favor of a quick hit. And we don’t look past that. We put our owl or peacock on our cubicle and check off the box: we’ve done that silly test that HR makes us do. On the up side, we take a little insight and move on. On the down side, we write off the dove as too meek to really add much value in our decision-making process. I like Myers Briggs. Not because they have 16 “types” versus 4. It is because it is a process of learning and reflection that can be a helpful tool in understanding self and others. A Myers Briggs workshop contains exercises that allow participants a deeper understanding of what the results mean, and an opportunity to explore similarities and differences. 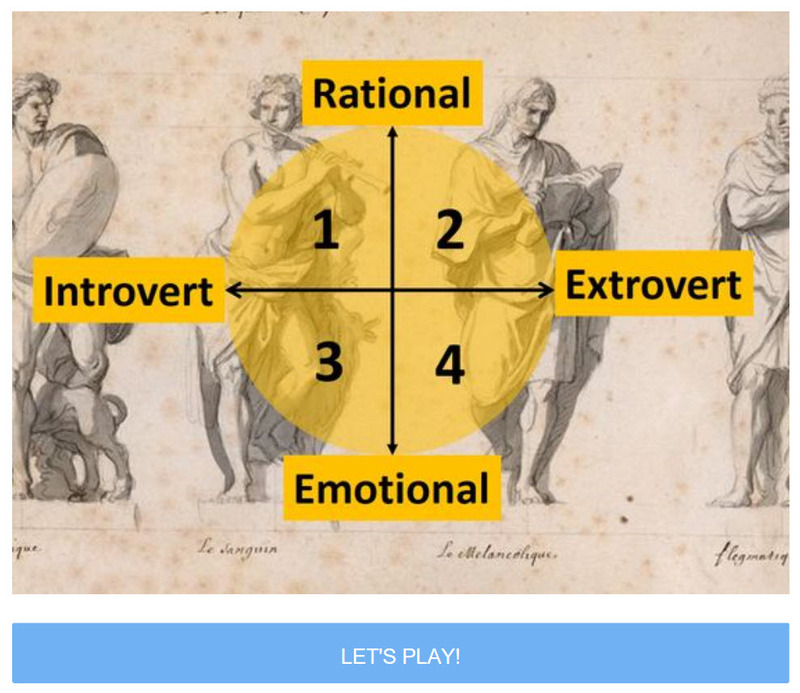 Even with Myers Briggs, though, it can easily be reduced to a parlour game. A quick run through of the methodology and a booklet that defines your “type” can be accomplished in an hour or so. At least, it is a little more complicated to create a stereotype. My cynicism is probably showing, and that’s unfair. So how can these various assessments be useful? All of the quadrant assessments, (DiSC, Birds, Personalysis, etc.) have component parts, most evolving from the work of Carl Jung. In DiSC, the components are task focus vs people focus, and process focus vs action focus. Personalysis is based upon decision-making, interpersonal connections and contribution style. Rather than focus on the whole, the real insight is in the components. In working with people and problems, are you more focused on the problem or the people? That’s important to know, and often explains where conflict occurs. In groups making decisions, both are important but somewhere in the middle is the right decision. Using an analysis to better understand where your focus lies, and where others might be focused, helps to broaden understanding, be open to others’ input and consider all of the options. Recognizing that some people see and adopt a solution quickly, while others ponder all of the different aspects can provide a means of building understanding and respect for both camps – the need to both investigate and then to decide. Somewhere in the middle is the right balance – enough information and time to move. Bring those components out in the open. Talk about why one person favors quick action, while the other feels compelled to continue investigating options. Come to a point of agreement where everyone is comfortable understanding and talking about their “gut” reaction. Once that has occurred, the group can recognize when one side is out of balance – too quick to decide, or analysis paralysis – and talk about how to move along toward a decision. It is easy to make a judgment when you “know” a stereotype. Oh, she is an introvert which is why she is quiet in meetings. He gets too much into the weeds because he is a sensor. Instead, turn that insight into a useful tool. For the individual that is quiet in meetings, explore the “why.” Ask directly for her opinion. If she doesn’t respond in a meeting, try a one-on-one. Perhaps she is not sure her opinion will be welcome, and may open up in a safe space. If someone is dragging their feet about making a decision because they want more information, ask about the possible downsides of making the decision now. Perhaps there is wisdom there. These assessments have their place, and it is not as a parlor game. Yes, you absolutely can laugh at yourself and have a good time as the realizations of why people do what they do become apparent. But there is a science to all of them, and it is never as simple as one letter, or four letters. The very best these tools can do is provide insight, to help you and your team learn and reflect.